Like many people, I trained in first aid while still at school, when learning the recovery position, CPR, how to stem bleeding and bandage a wound was seen as an essential life skill. Again, in common with so many, I retrained when I became a mother – for what parent doesn’t want to be able to react correctly when her child injures him or herself, or falls unexpectedly ill? But in today’s fast-paced, highly driven world, it’s not injury or physical illness, but mental ill health, which is causing increasing concern. 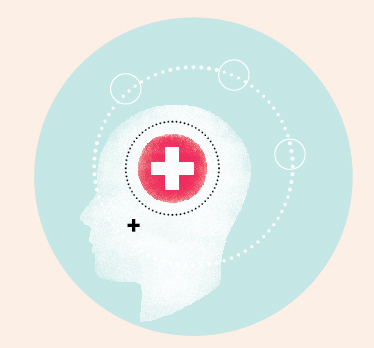 Such is the stigma surrounding mental ill health, accurate figures are hard to come by – experts believe even the World Health Organization’s own statistics likely underplay the problem, with reluctance to report and seek help among sufferers still a global issue. What we do know is that the WHO’s World Mental Health Survey, carried out from 2001 to 2003, revealed mental illness rates of up to 26 per cent of all adults in the western world, while in the UK, an estimated 13 per cent of all sick days are attributed to mental ill health. Interestingly, experts now believe that around half of all adults who suffer from mental illness will have their first onset by their mid-teens or in early adulthood, making identifying and treating problems early on a key target in many developed countries. But with self-reporting rates still low, a movement is now underway to ensure that more parents, employers, teachers, HR workers and managers are educated to spot the signs and symptoms of early onset mental illness. Enter Mental Health First Aid. “Mental Health First Aid was founded in Australia in 2001 by a nurse practitioner, Betty Kitchener,” explains Farah. “Betty was diagnosed with clinical depression and dreamed of a way that people could help individuals with a mental health issue, the same way traditional first aid does. “Since then, Mental Health First Aid has spread to more than 23 countries, over two million individuals have been trained, and it has become part of national policy in the US and the UK – President Obama invested US$20 million in MHFA training with the goal of having three million Americans trained, while the UK Prime Minister, Theresa May, has funded £15 million with a goal of having one million trained. Knowing the early signs is key, says Christine Kritzas, a counselling psychologist and another of The Lighthouse’s MHFA instructors, who warns that Dubai’s busy expat culture can be particularly challenging for many people’s mental health. “When an individual’s coping mechanisms are outweighed by their stressors, it can have a negative impact on their emotional functioning. Given the fast-paced, transient nature of the region, expats may often feel overwhelmed and stressed in their daily lives and not have adequate resources in place to deal with this. Being an expat living in the UAE may come with its own challenges – having a limited support group, feeling lonely and isolated, having to rebuild one’s professional network – which may then make one more vulnerable to experiencing mental health difficulties. Both experts say that, just as the parents of newborns often embark on a child first aid course, so the parents of adolescents or those approaching the teenage years should consider the importance of recognising the early signs of mental ill health. “As parents,” says Christine, “we need to place the same level of importance on our children’s emotional development as we do when it comes to their physical and intellectual development. In order to do so, parents need to be equipped to be able to detect when their child is presenting with significant indicators of emotional difficulties. Such is the level of concern about the difficulties the next generation is facing in terms of mental health stressors, the clinic has launched a specialist version of the MHFA course aimed specifically at the parents, teachers and carers of adolescents in order to equip them with valuable information, communication techniques and more. Lighthouse Arabia will be running quarterly MHFA courses throughout 2018. Participants will receive credit points from DHA, and a certificate of MHFA accreditation, valid for three years. The next adult course will begin on May 3, while the next course focussing specifically on adolescent mental health will begin on May 10. Courses cost Dhs1,550 per person, plus VAT. Deterioration in functioning – An unusual drop in functioning at school, work or in social settings. This can manifest as failing class tests, or experiencing difficulty performing familiar tasks at work. Emotional withdrawal – Recent social withdrawal or loss of interest in being around loved ones. Mood changes – Many people present with an irritable or low mood more days than not. Difficulty concentrating – Finding it hard to focus on tasks, experiencing a ‘clouded mind’ or being more forgetful than normal. Feeling indifferent – This can manifest as a lack of interest, enthusiasm or concern for people, events or activities. Feelings of worthlessness– Feeling as though one has no purpose or reason for living is a common symptom that is worth looking into. Fatigue– Feeling tired despite getting adequate sleep can be an indicator of illness. Low motivation– Feeling unmotivated and lacking drive. Excessive worrying– An increase in intensity of worries or feelings of guilt can point towards anxiety or other mental illness.